I don't know anybody who doesn't crave a little more organization in their lives. 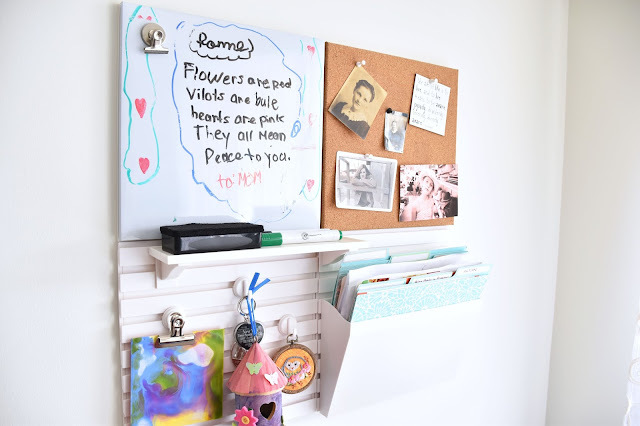 Even the most organized among us have a hidden junk drawer, a pile of papers at the edge of a desk or an overflowing sock drawer. If you have kids, well, be prepared to double or triple your organizational challenges. I am into my third year of serious decluttering of this house. Not even kidding. And we still have a basement storage room that needs about 5.5 days of work. But we have many areas that look much better now, and it has given me hope that the whole house will be pared down, organized and run like a well-oiled machine...in about one more year. A big focus this fall has been my home office area. I have written a series of blog posts around decorating and organizing this office space. 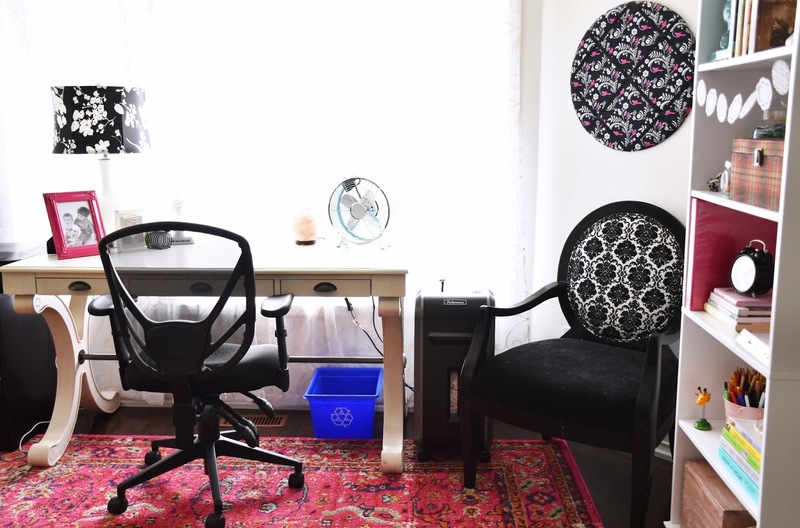 The first post was about my office decor from Wayfair - a new desk, rug and drapery. 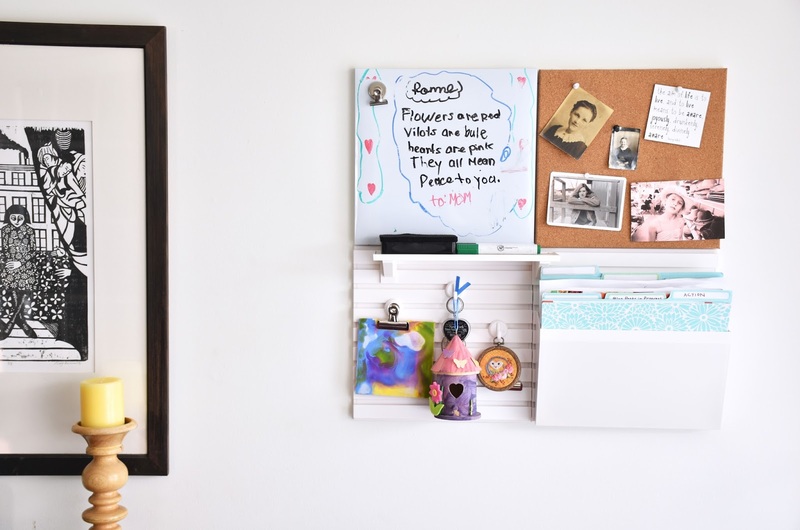 The next post was about my new Canadian Tire Canvas bookshelf, which provides (attractive) storage space for office supplies, receipts and motivational books. 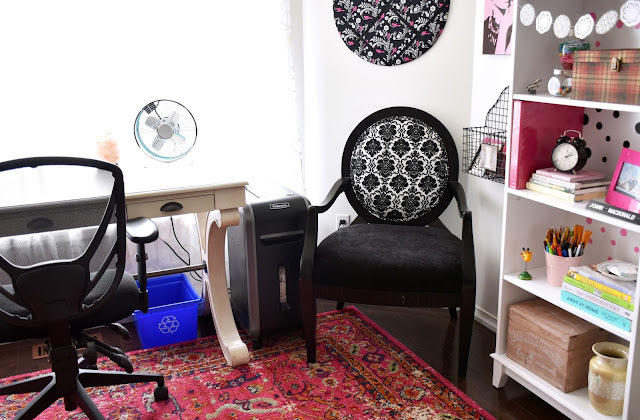 Giving the home office a new look has motivated me to keep it tidy and organized. 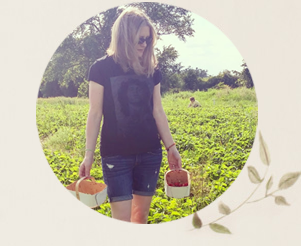 I have a very specific plan for doing so and I want to share it with you today. My organization plan involves some physical resources and also a few very specific practices for dealing with paper and avoiding paper clutter. Here are the basic bones of my paper organizing system. 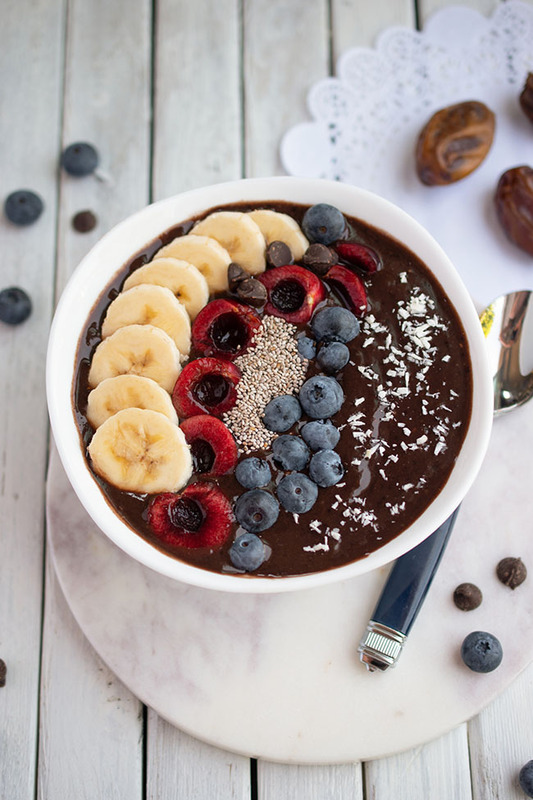 The same elements may work well for you, or you might want something totally different. I like my storage to be easily accessible, but I still want things to look tidy and attractive overall. Some people like to have their papers right out in their face - in that case, look at organizing systems like magazine file boxes on the desk or bookshelf. The filing cabinet is on one side of my desk, the paper shredder on the other. My action folder is out in the open because clearly "action" implies there are steps to be taken in the near future. This folder isn't meant to be forgotten. I put it right at the front of the hanging file holder in the Martha Stewart wall storage system I got at Staples, above. My work binder is on the bookshelf to the right of my desk. The hanging basket for mail is mounted on the wall beside the bookshelf. The small recycling bin is under the desk. I keep an attractive lidded box on the bookshelf to house (and hide) business-related receipts. Our main family calendar is on the fridge. I also have a planner on my desk. Each element of my paper organizing system is within reach, just by rolling my office chair right or left. Because if I have to get up, it might not get done right away and then, hello paper pile-up! Take 5 minutes to tidy your desk each day that you use your office, before you use it. It will make your work much more appealing and efficient. Deal with mail immediately → recycle, shred, file or move to action folder → Recycle junk mail and envelopes. Shred mail that contains personal information. File needed information in the filing cabinet. Put time-sensitive items in the action folder. If you can't deal with mail right away, put it in a hanging basket in plain sight and sort it at least once per week. Schedule the task in your calendar so you don't forget. After tax time, shred old tax papers that are no longer needed. The Canada Revenue Agency recommends keeping tax records for 6 years. Check the rules in your area. Sort through kids' school papers daily → Shred paperwork that's not needed. Sign cheques and fill out forms immediately and put them right back in backpacks. Mark any important dates on the family calendar. Keep required information (about future trips, events, etc.) in a folder or wall basket. (I have a wall basket in the kitchen for those.) Report cards and noteworthy artwork/achievements can go into a memory box for each child. Organize a binder for work-related items, like schedules and invoices. Get a binder that you enjoy using. Mine is pink (to go with the touches of pink in my office) and contains invoices and blog stats. Develop a system to ensure bills get paid on time. Some or all of your bills may get paid automatically from your bank account each month. I have a few bills that I prefer to review before paying. When they arrive in the mail, I immediately note the required payment date on the family calendar and in my planner. I then put the bill in my action folder so I always know where it is when the due date arrives. Put grocery coupons in an envelope or small, expandable coupon folder - mine stays in my purse. Discard expired coupons monthly. File tax papers, bank and investment details and medical/dental/orthodontic records in the filing cabinet in titled file folders. I bought a big batch of file folders to keep handy for when I add a new category. A key resource to help you organize your home office is a good shredder. I was using a small shredder that was able to shred a few sheets of paper at one time. It would work for a brief period before needing a cool-down. 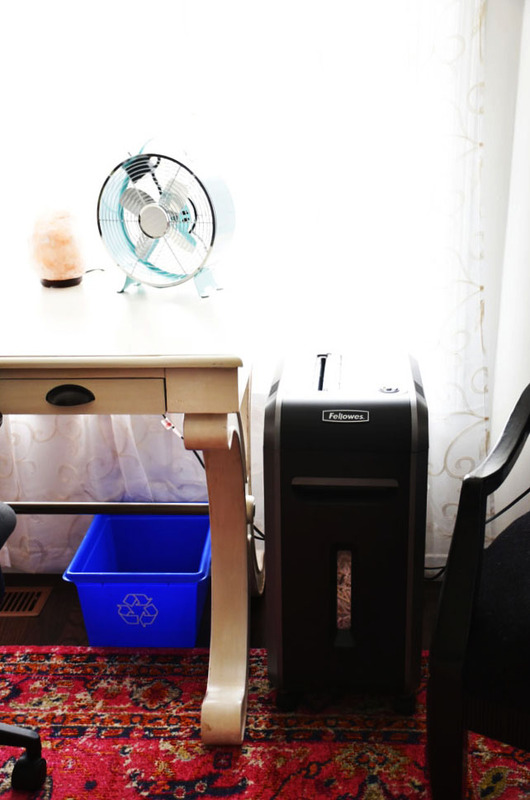 As a small business owner with a home office, I sought the benefits of a more powerful shredder - one that handles more paper, in addition to other materials such as cds and staples, and can run for longer periods of time without the need to cool down. 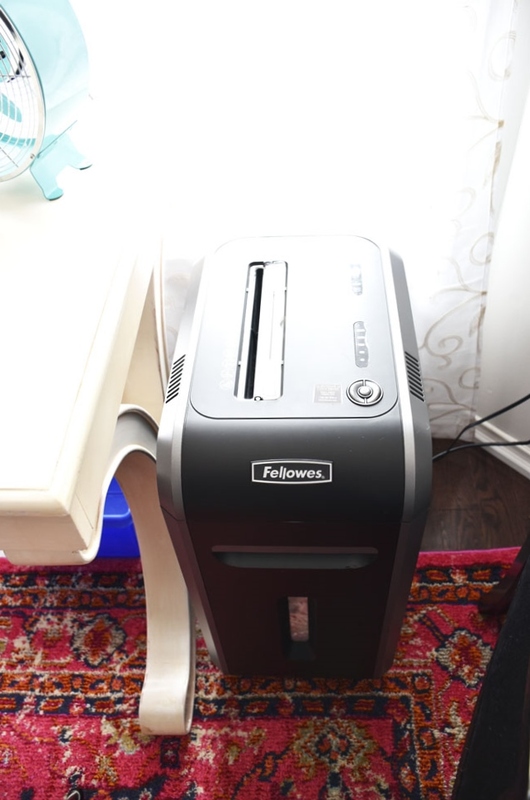 Fellowes - the inventors of the personal shredder - has created shredders for everyone from the occasional user to government officials who need high-security shredding. I'm somewhere in the (lower end of the) middle. Paper is cross cut for higher security; the shredder creates approx 397 particles per sheet. It handles 18 sheets at once! It also powers through CDs/DVDs, credit cards, staples, paper clips and junk mail without jamming. Runs up to 30 minutes before automatic cool down. The shredder has SafeSense® technology, so it automatically stops when hands touch the paper opening. It uses an energy savings system for optimal energy efficiency. SilentShred™ means quiet performance for shared workspaces (or sleeping babies). The machines starts and stops automatically. Just put your paper or other material through the slot. The PowerShred® 99Ci has a 9-gallon waste bin, with a handle to pull it easily away from the machine so you can dump the paper in a garbage bin (or line it first with a bag). The machine comes with oil for occasional maintenance. I watched this YouTube video for a 2-year review of the PowerShred® 99Ci. Spoiler alert - the shredder was still running well after 2 years. It was doing everything it's supposed to do, with occasional oiling. Apparently you just shouldn't use it as a chair (in case you were tempted)! When you're choosing the right shredder for you, take note of the "direction" of the machine - ie. where the paper basket removes from (the long side or the short side). I wanted the basket to be on the narrow side of the shredder, so that the shredder's depth could go alongside my desk, to kind of tuck it out of the way, but keep it within reach to easily shred papers while sitting at my desk. Remember, I don't want to get up unless I absolutely have to! Except for tea...a good hot beverage is essential to the organization process too. Do you have any office organization tips? 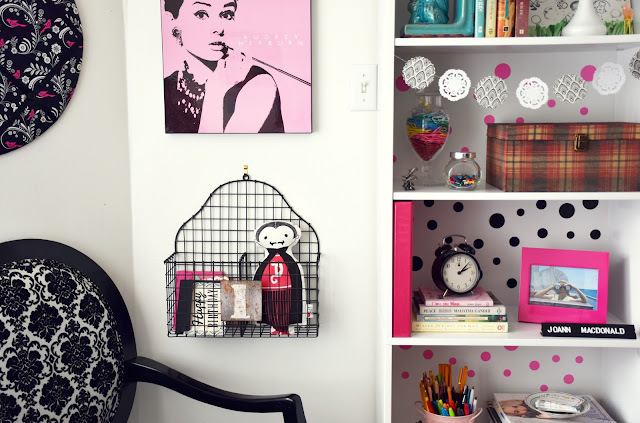 Is there any yucky paper clutter in your house? Could your home office use some organizing? Joann, that’s my kindergarten/ grade 1 teacher’s picture on your cork board— -79 years ago! You have such a nice office!